A lot of people know about Atari, the arcade games and video games company, founded in 1972. Also, a lot of people know the term “atari” from Go, meaning a group with only one liberty, in danger to be captured. There is also a simplified variation of Go, called “Atari-Go” or “Capture-Go” – one can play that online here. But not some many people know that the arcade game company borrowed the name from Go! I just found that out myself today, when I learned about this video interview of Atari founder Nolan Bushnell where he declares Go as the favorite game of his! 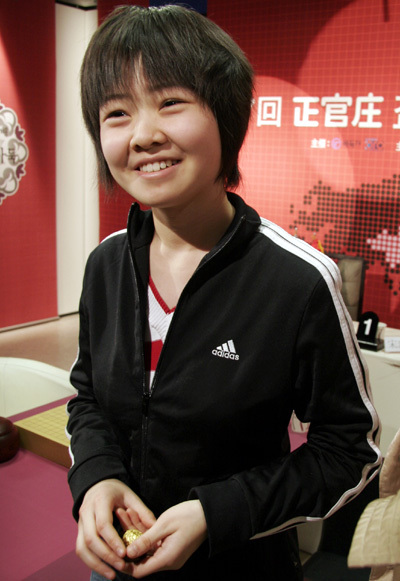 Cho U (shown in the official Nihon Ki-in photo below), challenger for the Japanese Judan title, won game 2 by 4.5 points against the title holder Takao Shinji. The score is now 1:1. Game 3 will be played on April 9th, in Japan. Yamashita Keigo defended his Kisei title against challenger Yoda Norimoto by 4:2. Yamashita, playing white, won the 6th game by 2.5p after building a lot of thickness in the center early on, which translated into a big moyo. Game record for game 6 is here. More photos from the match here. Game 6 of the Kisei Title started today. The score is 3:2 in favor of the title holder, Yamashita Keigo. The challenger, Yoda Norimoto (playing the first move in the photo below) needs to win both this and the last game in order to capture the title. Here is another photo of the two players, enjoying the sound of the thick goban on the day before the match started, and taking photos for the press, while Rin Kaiho (seated) and Takemiya Masaki (standing in the back) are watching. For more photos from this title see the Yomiuri online page. See the match page here, including the moves up to now. Good news: WIRED recently published an article about Computer-Go. Bad news: WIRED article author doesn’t understand how “handicap” makes a big difference in Go, and claims “a program called MoGo beat two professionals. At an exhibition in Chicago, the Many Faces program beat another pro”. Actually it’s true, Computer-Go made a very surprising and quick progress recently, but still, 7 stones handicap is… a lot of handicap. 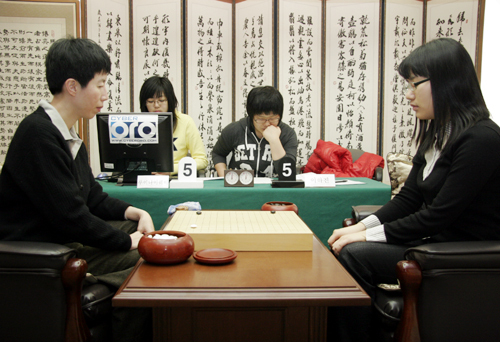 The heroes of this year’s Jeongganjang Cup are two very young shodan players from China: Song Ronghui and Li He. Song Ronghui 1p eliminated Lee Daehyeoi 3p of Korea, Kato Keiko 6p of Japan, Lee Hajin 3p of Korea, Mannami Kana 4p of Japan, Kim Hyeoimin 5p of Korea and Aoki Kikuyo 8p of Japan – an AMAZING winning streak! You can see Song Ronghui in the following photo. Then Li He eliminated Park Jieun 9p of Korea, Umezawa Yukari 5p of Japan and Lee Minjin 5p of Korea. 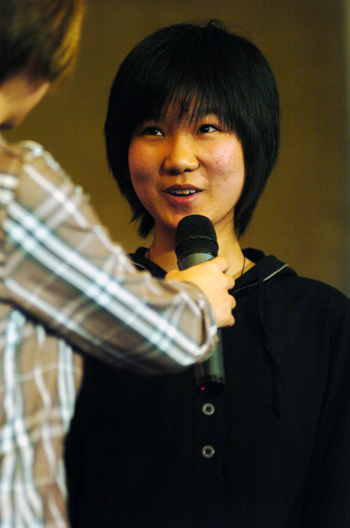 Li He defeated Lee Minjin 5p of Korea in the final game. As Japan has already been eliminated earlier, and Lee Minjin was the last standing player from the Korean team, Li He won the victory for China with this win. China had 3 more players who didn’t have to play even one move in this tournament! Here is the Li He – Lee Minjin game record. Tournament table here. More photos here, here, here, here, here, here, here, here, here and here. 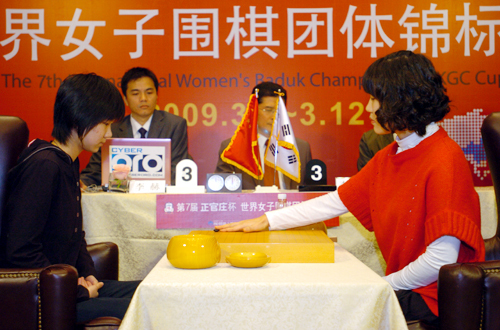 Rui Naiwei 9p defeated Lee Hajin 3p 2:0 in the Korean Women Kuksu final. In case you don’t know already, Lee Hajin keeps a very nice English Go/Baduk website. Make sure to have a look at the commented games as well. Here is the game record for game 1. Here is the game record for game 2. Hane Naoki, currently Honinbo and Okan holder in Japan, won NEC Cup as well yesterday after defeating Cho U in the final game. Here is the game record. Hane, playing black, won by resignation. 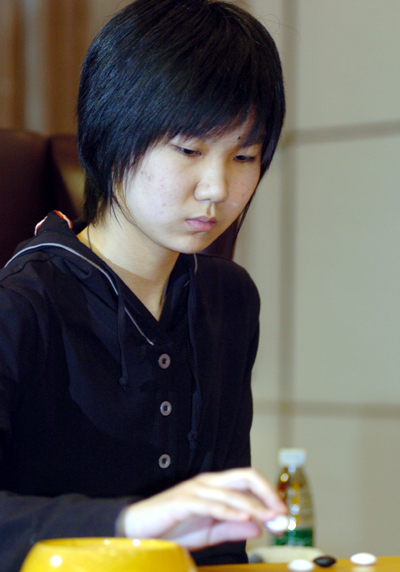 Choi Cheolhan won the third game of the Ing Cup final against Lee Changho by resignation, thus leading the match 2:1. He needs one more win to capture Ing Cup, which is the best paid international tournament: USD 400,000 for the winner, and USD 100,000 for the loser. Here is the game record. More photos here, here , here, here and here. You are currently browsing the 361points.com/blog blog archives for March, 2009.